Are you looking for plastic plates for weddings and just can't find the right one? 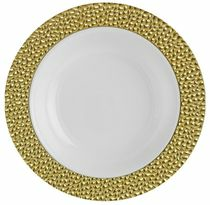 The White W/ Gold Hammered Plates are beautiful and elegant additions to your catered event or wedding. They have a sophisticated design and when you're done, clean up is easy. If you're looking for disposable plates for weddings, then examine out selection. These gold plastic plates are a favorite for weddings, anniversaries and fundrasiers because they have the look of fine China, but won't break when dropped and can be thrown away when the event is over. Don't pay out the nose for fine China when you can get the look without the price. Set your table with Elegance! 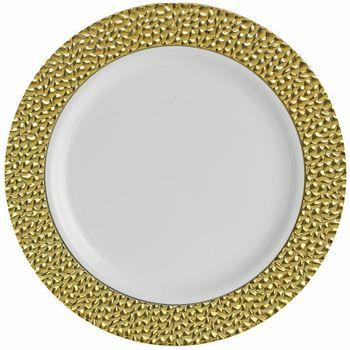 Enjoy our new line of premium designed plastic plates with a gold hammered border. Available in 10.25" 9", 7" plates and bowls as well. 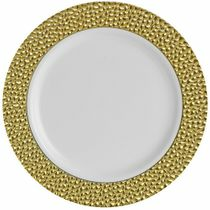 Hammered Collection 7" White w/ Gold Hammered Border Salad / Cake Plastic Plates 10ct.